Application list for screen-ON cellular communication. This is the line specifies application(s) to communicate at the screen-ON. With this indication, all the application(s) are able to communicate when the screen is ON. With this indication, only specified applications are able to communicate on cellular even the screen is ON. This is a menu to set operation at the screen ON. 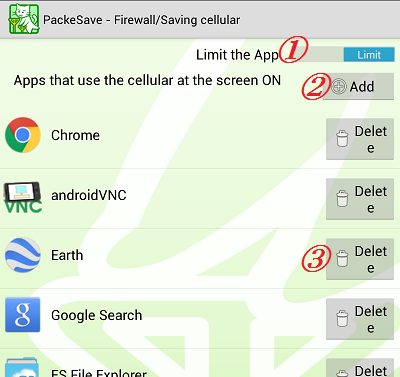 At the initial setting, No apps are in the list with [No limit] indicated in the top part (1). You can specify whether or not limit cellular communication during the screen ON. If you tap the top part (1) and set it as [Limit] like this picture, only the specified applications are able to communicate on cellular at screen-ON. When you tap the [Add] button (2), you can add an app in the list. When you tap the [Delete] button (3) on the right side of each app, you can remove the app from the list.